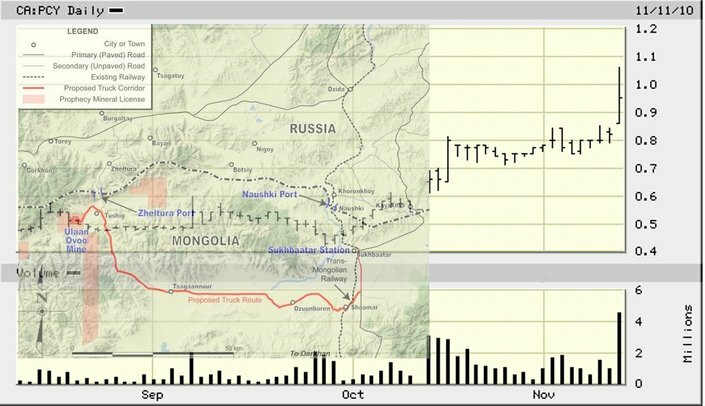 Following yesterday's announcing of the final permit for mining operations at the company's Ulaan Ovoo coal mining project in Mongolia, Prophecy Resource Corp. (CVE:PCY), (PINK:PRPCF) stock made the opening ceremony for its at least mid-term upward move. Yesterday, on the TSX Venture Exchange PCY soared 15.85% between the sessions. The huge demand for the shares made a quadruplicated average trading volume of more than 4.5 million shares. During the official opening of PCY upward move, a new 52-week high was noted. If its quantitative expression was $1.06 per share, the qualitative was the willingness of investors to trade PCY stock beyond the symbolic for traders $1 price level. On the American premier OTCQX market tier, investors enjoyed a 16.66% price increase for PRPCF. Today, the shares of Prophecy Resource Corp. added 6.09% in value on the Frankfurt Stock Exchange, while on Xetra they advanced by 3.62% from the previous day. Prophecy Resource Corp. received the final permit to commence mining operations at its Ulaan Ovoo coal mining project in Mongolia this Tuesday. The company has a 100% interest in the Ulaan Ovoo Mine. The Mongolian Government has granted the project a fully transferable 30-year mining license that can be extended by additional 40 years. As stated by the company, the mine is ready for production and the official mine opening ceremony will be held on November 20, 2010. Prophecy Resource Corp. Stock (CVE:PCY), (PINK:PRPCF) Is This the End of the Retreat?